Home > Quick Quizzes > What Sort of a Speaker Are You? The problem is, of course, that unless you’re a professional speaker, very few of us make speeches often enough to find out just what this kind of “being yourself” really means. So, are you bold or timid, confident, or perhaps a little over-confident? Will you sell your soul to get in the limelight, or would you sooner walk a mile, barefoot, over broken glass? Take our light-hearted quick quiz and find out once and for all what sort of speaker you really are. at your friend’s wedding. What’s your first thought? a) Oh wow! I’m so pleased they asked me to be a part of their big day. b) Brilliant! Now I get the chance to tell everyone what really happened in Corfu. c) Help! I’ll have to make a speech! at an elderly relative’s funeral. Now what’s your first thought? a) What an honour; I’d better do my research to make sure I do him/her justice. b) Fantastic! I’ve heard so many stories about what they got up to in the war. c) Help! Now I’ll really have to make a speech! a) Wait, and if nobody else volunteers, put your own hand up? b) Do everything you can to be picked, short of jumping up and down shouting “me, me, me”? c) Suddenly remember that you’ve left a vitally important paper clip in another room and hurry off to look for it for an hour or two? a) Go for a short – and rather clever – word-play? b) Tell three related knock-knock jokes in quick succession, one after the other? c) Briefly toy with pretending to faint, before managing to stumble through something that’s greeted with polite – but largely unconvincing – laughter ? a) Listen politely and murmur “hear, hear”? b) Jump in with a tribute of your own? c) Disappear to the toilet before it turns into one of those events where everyone ends up having to say something? 6. Would you ever turn down the opportunity to speak? a) If someone else better or more appropriate was available, then yes, of course. b) Absolutely not. Never, never, never! c) Oh yes – at the drop of a hat and for any half-ways plausible reason that I could possibly think of! Mostly (a)s – you’re one of life’s truly reliable people and make a very dependable speaker. 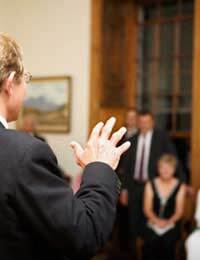 You understand the importance of a good speech and you’ll always try to get the right tone for the particular event. You’re certainly not the sort to push yourself forward, but you can always be relied upon to step into the breach and you’ll do a great job, now that you’ve been asked. You never know, carry on like this and you might even develop a taste for it! Mostly (b)s – well, you’re definitely up for it! Nobody could doubt your enthusiasm and your speeches will never be short on ideas, but you may have to work quite hard at deciding which ones to use and which to discard – and do be careful that some of your stories don’t go just a bit too far. You’ll need to make sure you don’t let your confidence trip yourself up, but otherwise, nothing much fazes you. Nerves – what nerves? Mostly (c)s – you really don’t feel comfortable making a speech, do you? Even thinking about it is beginning to make you feel a bit sick – but you’re realistic enough to know that there are times when you just can’t get out of it. If this is you, then you can relax a bit because you’re in the right place; this site was set up to help. Take a look around – whatever kind of speech you need to make, you’ll find plenty of hints, tips and examples that you can use pretty much straight off the page, so you’ll be well on the way in no time. You can do it; really you can. Whatever sort of speaker you are, we hope the tips on this site will help you out. Good luck with that speech!